I am currently sitting in my mini van outside the building that we just set up for an automated auction. It was an easy setup and we are now pretty much done 2.5 hours ahead of time. We could have been done even sooner but took our time. I have sort of blogged about Auction Automations before, but never really explained too much about it. If you would like to read about it, http://www.auctionautomations.com/ . 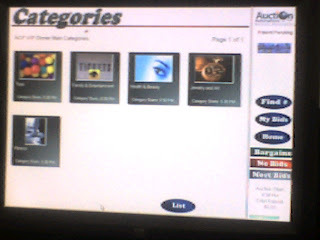 I sort of have mixed feelings about the whole idea of automating silent auctions as a business. For those of you who didn't go to website and who I have not talked to about it, basically what we do is setup a network with SQL server and use tablet PCs to enter bids rather than the traditional piece of paper that most silent auctions use. We have a bunch set up on the tables with the items and a bunch of "roaming tablets" which connect wirelessly to the network. It is more fun than the old paper based system and people LOVE us. No one in the area does this and so people who are used to the old paper based system just think it is so much cooler than any silent auction they have been to. Having everything in the computer also make things much easier for he people who put on the auction. It is a lot of work to setup an event, and computers are expensive. And it is sort of hard to juggle a fair price for our service against the fact that the silent auctions are meant to raise money for charities. Every dollar they pay us is one that can not go to the charity. Getting work is not a problem. People love us. No one else does this. And it appears that we really are not charging enough. We charge a percentage on the silent auction proceeds with a minimum. It basically takes about 10,000 in proceeds to get to our minimum. Early on, we were getting events in the 30 or 40 thousand dollar range and that was nice. But lately we have been getting right around the minimum. For the most part it is the same amount of work for us for a 10 thousand dollar event as it is for a 60 thousand dollar event. We are doing Ok. We are not in real danger of losing too much on this. But I do not think we are "in danger" of becoming rich either. And it is sort of fun to do these things, especially since people always tell us how awesome we are during these things. But sometimes I wonder if it is worth it. Most of the time I wonder. Typically, we do a couple events a month. For us, an event basically starts early in the morning. We unload everything, and setup servers and lay cable for the network. Then we place tablets and charge the roamers. By the time the event starts we have typically spent an 8 hour day setting up and testing. Then we do the silent auction which is usually lasts 3 or 4 hours. Then it takes us a couple hours to tear down and load the trailer for going home. I am getting too old for this kind of a work day. Especially since we are not getting paid. As owners, eventually we will get paid. But, I am just not sure if it will ever end up being worth the effort. Needless to say, I have not quit my day job. I am self - employed with a client who is understanding about having to take time for auctions, so I am in a perfect situation for doing this. I also manage to spend more time with my family than most people (I think). So, that is not really a problem. I just wish that we would start getting 50 thousand dollar events on the norm rather than 15 k events. And wish we could hire other people to do this for us. Although, if I stop doing these completely no one will tell me how awesome I am. Well, that is not true. Tyler told me I am an awesome Dad. I should get back in there. My partners probably think I have deserted them.